Male euglossine bees collect fragrances from various sources, which they store and use for as yet unknown purposes. They are attracted, often specifically, to single odor compounds and blends thereof. We used gas chromatography with electroantennographic detection (GC-EAD) and electroantennography (EAG) to investigate the response to 8 odor compounds by males of two euglossine species, Euglossa cybelia Moure and Eulaema polychroma (Mocsàry). In E. cybelia, we recorded EAD reactions in response to 1,8-cineole, methyl benzoate, benzyl actetate, methyl salicylate, eugenbl, and methyl cinnamate. 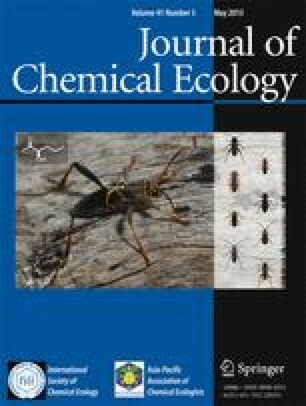 E. polychroma responded to the same compounds in EAG experiments, while (ls)(-)α-pinene and β-pinene failed to trigger EAD or EAG responses in the bees. Blends of two compounds triggered larger responses than single compounds in EAG experiments with E. polychroma, however, when α-pinene was added, reactions decreased. In the light of existing data on the bees' behavior towards these odor compounds, our work indicates that both peripheral and central nervous processes influence the attraction of euglossine bees to odors.